A parliamentary report of 1777 recorded a parish workhouse in operation at Wells St Cuthbert for up to 30 inmates. County of Somerset: Baltonsborough, Butleigh, Chewton Mendip (2), Dinder, Glastonbury (3), Meare (2), North Wootton, Priddy, Rodney Stoke, Street, Walton, Wells - Liberty of St Andrew, Wells - St Cuthbert In-Parish (3), Wells - St Cuthbert Out-Parish (3), West Bradley, Westbury, West Pennard, Wookey (2). Later Additions: Godney (from 1904), Green Oare (1858-1885), Sharpham (from 1894). The population falling within the Union at the 1831 census had been 19,197 with parishes ranging in size from from West Bradley (population 132) to the Wells In-parish of St Cuthbert (3,430). The average annual poor-rate expenditure for the period 1833-35 had been £7,683 or 8s.0d. per head of the population. 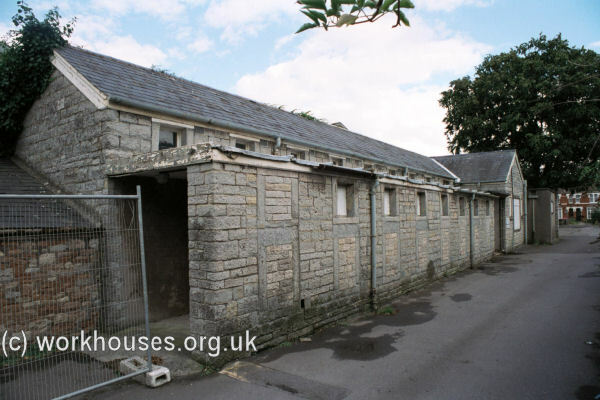 A new Wells Union workhouse was erected in 1836-7 at the north side of the Glastonbury Road in Wells. The Poor Law Commissioners authorised an expenditure of £4,850 on construction of the building which was intended to accommodate 300 inmates. 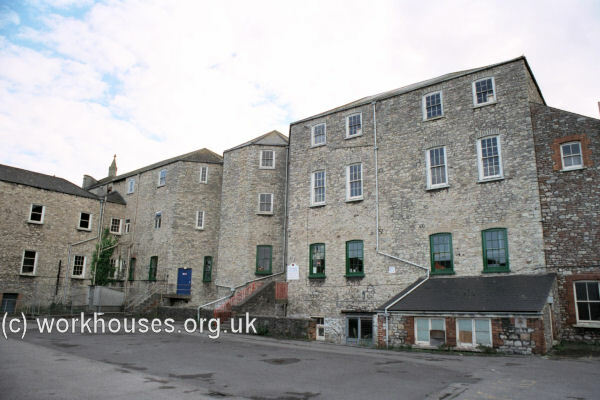 It was designed by Samuel T Welch who was also the architect of workhouses at Axbridge and Clifton. His design for Wells was similar to that at Axbridge. The site location and layout are shown on the 1903 map below. The main building had a T-shaped layout facing to the south-east. Male accommodation was at the east, and female at the west. 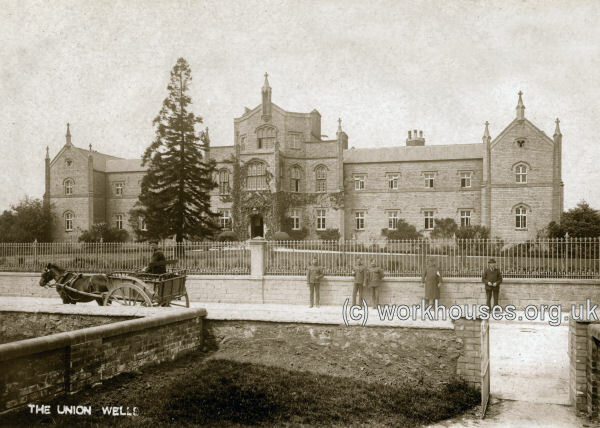 Wells main building from the south-east, early 1900s. Wells main building from the east, early 1900s. Wells main building from the south, 2000. The workhouse chapel was located at the centre rear of the main block. 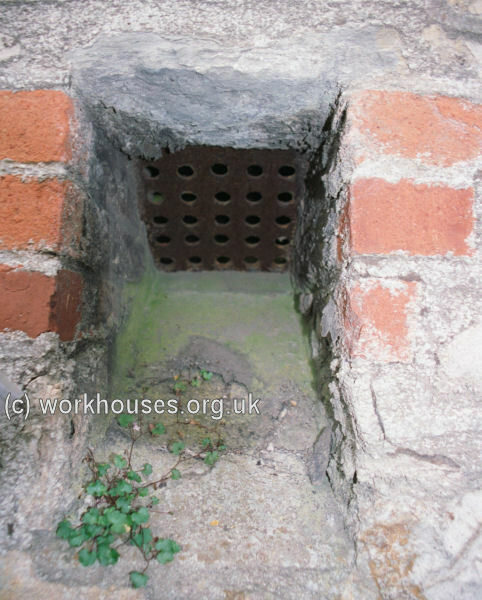 This connected to an octagonal section which contained the workhouse Master's quarters. Wells rear of main block from the north, 2000. A serious cholera outbreak in 1866 led to the setting up of a cholera hospital in rooms previously occupied by the schoolmistress and female children. 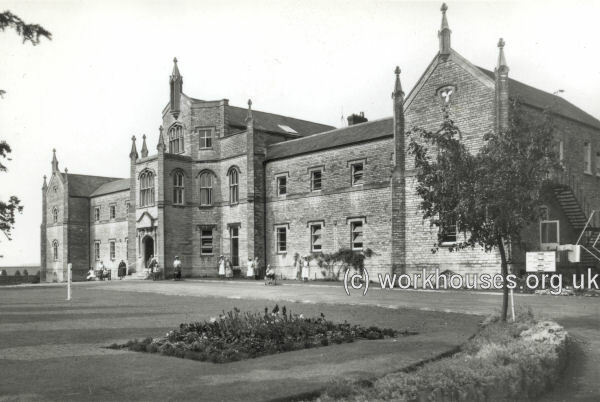 Five years later, in 1871, a new infirmary was erected at the north of the workhouse. A small infectious block was placed at the west of the infirmary. Wells infirmary from the south, 2000. A vagrants' block was placed the north of the males' yard. It contained a row of six stone-breaking cells. 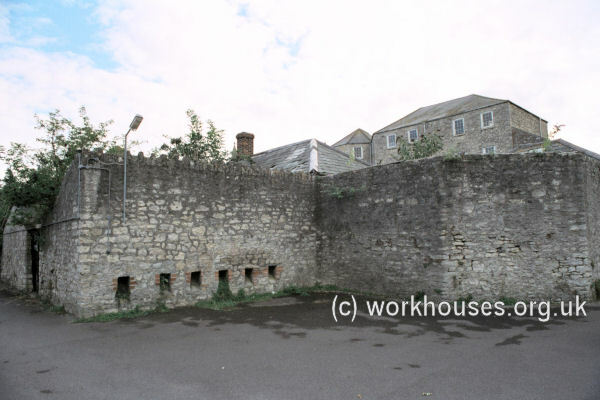 Wells vagrants' cells from the north, 2000. Vagrants had to break up a measured quantity of stone into pieces small enough to be dropped through a metal grid to the yard outside. The amount of stone required to be broken was decided locally by each Union. In 1907, The Wells Guardians increased the daily amount from 4 to 5 hundredweights. Since other Unions demanded even more (7 cwt. at Shepton Mallet, and 13 cwt. at Axbridge) Wells was a popular stop for vagrants. Further vagrants' accommodation was erected to the east of the men's yard in 1902. Wells 1902 vagrants' ward, 2000. From 1904 onwards, the birth certificates of those born in the establishment did not mention the word 'workhouse'. 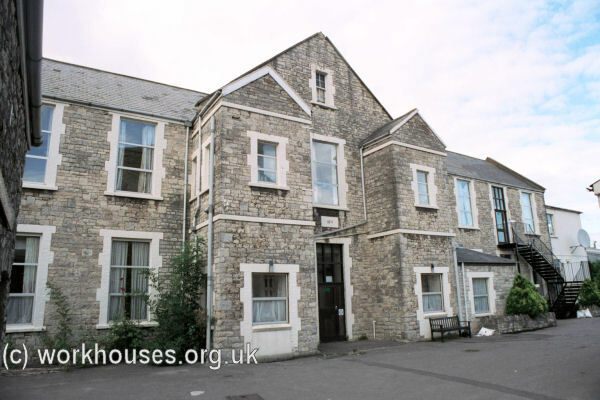 Instead, to prevent any future stigma being attached to such individuals, the place of birth was recorded as Rowdens House, Glastonbury Road, Wells. In 1930, Somerset County Council took over control of the workhouse site which was redesignated as a Public Assistance Institution. In 1948, the establishment became part of the newly created the National Health Service and became known as Wells Infirmary. In 1961, the name was changed, yet again, to Priory Hospital. The site has now been redeveloped with demolition of the peripheral buildings. The Wells Union established several children's scattered homes. One at 42 Northload Street, Glastonbury, was in use by 1914. Others were located at Magdalene Street, Glastonbury; 14 Lawson Terrace, Wilfrid Road, Street; and Wraxhall Road, Street. Each home housed around a dozen children under the care of a house-parent. 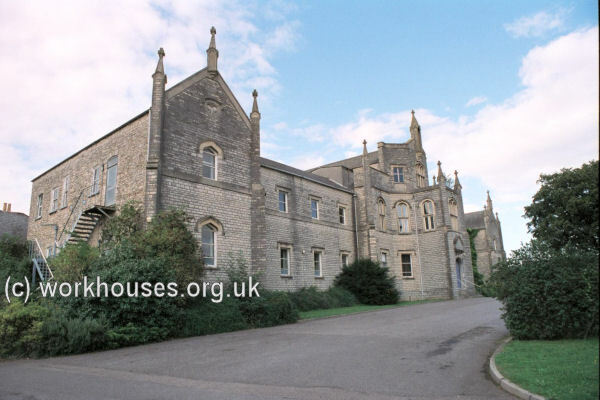 Somerset Heritage Centre, Brunel Way, Langford Mead, Norton Fitzwarren, Taunton TA2 6SF. Holdings include: Guardians' minute books (1835-1930); Admissions and discharges (1912-14); etc. Priory Hospital - Now and Then (1988, author unknown).